Joe Worrall scored his first senior goal as Nottingham Forest bounced back from successive defeats to beat Bolton. Worrall pounced on a loose clearance to smash home and Liam Bridcutt put Ben Brereton clear to make it 3-1. Walker's early goal proved a good omen for the hosts who have won every time they have scored the opener this season. But aside from Jak Alnwick turning Walker's shot around the post, Bolton grew into the game, albeit without threatening Jordan Smith's goal until Buckley's equaliser. Gary Madine and Vela had golden chances to put Wanderers in front after the break as they chased a first Championship away win in 36 attempts, but both headed off-target when unmarked. Mark Warburton's side took advantage of their let-offs and looked comfortable for most of the second half, but were still made to sweat at the death as Wilbraham almost carved out a last-gasp equaliser. Forest, who made it four wins in their past five home matches, move up two places to 11th, while Bolton's second defeat in 10 leaves them 21st and above the bottom three on goal difference. "We have spoken in the dressing room about how we can deal with games like this better. You have to stand up and fight, but you also have to do what you do well. "We got drawn into a physical battle and we went a little too direct. Other teams are better than us, when we try to play that kind of game, that is something we must improve on. "There are no easy games in this division. They are very good at what they do. You have to stand up, but our back four did that, we did that as a team. It is difficult, but you have to deal with it." "We nearly got back in it at the end, so we are hugely disappointed not to have got something. "I thought a lot of our play was great today but the second goal was the key moment that changed it; that changed the course of the game. "We are absolutely disappointed that we did not get all three points, never mind one. We have been punished by the third goal, when we had gone three at the back to chase it and left ourselves a little more open." Match ends, Nottingham Forest 3, Bolton Wanderers 2. Second Half ends, Nottingham Forest 3, Bolton Wanderers 2. 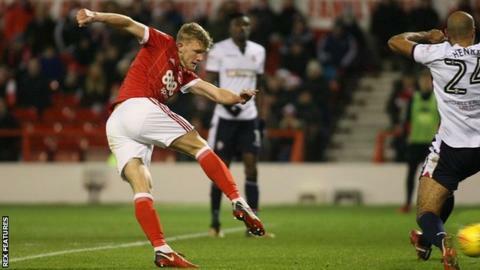 Own Goal by Joe Worrall, Nottingham Forest. Nottingham Forest 3, Bolton Wanderers 2. Attempt missed. Aaron Wilbraham (Bolton Wanderers) right footed shot from the right side of the six yard box misses to the left. Assisted by Mark Beevers with a headed pass following a set piece situation. Attempt blocked. Mark Beevers (Bolton Wanderers) left footed shot from the centre of the box is blocked. Attempt saved. Karl Henry (Bolton Wanderers) right footed shot from the centre of the box is saved in the top centre of the goal. Liam Bridcutt (Nottingham Forest) is shown the yellow card. Aaron Wilbraham (Bolton Wanderers) wins a free kick in the attacking half. Attempt blocked. Mustapha Carayol (Nottingham Forest) left footed shot from the left side of the box is blocked. Assisted by Andreas Bouchalakis. Goal! Nottingham Forest 3, Bolton Wanderers 1. Ben Brereton (Nottingham Forest) left footed shot from the centre of the box to the bottom right corner. Assisted by Liam Bridcutt. Substitution, Bolton Wanderers. Aaron Wilbraham replaces Mark Little. Karl Henry (Bolton Wanderers) is shown the yellow card for a bad foul. Kieran Dowell (Nottingham Forest) wins a free kick in the defensive half. Attempt missed. Tyler Walker (Nottingham Forest) right footed shot from the right side of the box is too high. Assisted by Liam Bridcutt. Andreas Bouchalakis (Nottingham Forest) wins a free kick in the attacking half. Substitution, Nottingham Forest. Ben Brereton replaces Daryl Murphy. Attempt missed. Reece Burke (Bolton Wanderers) right footed shot from more than 35 yards is high and wide to the right. Substitution, Bolton Wanderers. Craig Noone replaces Darren Pratley. Attempt missed. Kieran Dowell (Nottingham Forest) left footed shot from outside the box is high and wide to the right from a direct free kick. Substitution, Bolton Wanderers. Adam Armstrong replaces William Buckley. Hand ball by Reece Burke (Bolton Wanderers). Mustapha Carayol (Nottingham Forest) wins a free kick on the left wing. Foul by Mark Little (Bolton Wanderers). Liam Bridcutt (Nottingham Forest) wins a free kick in the attacking half. Substitution, Nottingham Forest. Mustapha Carayol replaces Barrie McKay. Substitution, Nottingham Forest. Andreas Bouchalakis replaces Ben Osborn.